As a PADI National Geographic Diver, you join an elite group of explorers, adventurers and conservationists. The insight and training you gain during this program will broaden your awareness and take your diving skills to a new level. You'll learn to observe and explore like an underwater scientist. 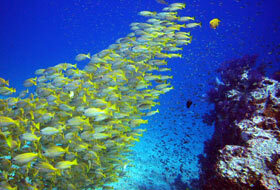 Most PADI Scuba Divers are fascinated with the aquatic world, which inspires them to learn more. Because you have already learned the theory and skills of diving, the PADI National Geographic Portal at Scuba Cat Diving, Phuket, Thailand gives you the opportunity to build on your dive experience to learn about new adventures, exploration and conservation opportunities. The PADI National Geographic Portal will help you take your dive experiences to a new level. How? You'll learn more about the world's oceans and waterways and discover details that will enhance your personal dive adventures. During the PADI National Geographic Portal at Scuba Cat Diving, Phuket, Thailand, you'll take your exploration skills to an advanced level by collecting data to construct a visual representation of what you explored. This project may result in a map, graph, sketch, diagram, photo essay or video. You and your instructor will decide on your area of focus and plan your dive accordingly. You'll also gain navigational skills that will aid in the exploration process. Your exploration skills will give you a new appreciation for the aquatic environment and add enjoyment to each dive. You'll find yourself sharing your discoveries with other divers and becoming a true underwater ambassador. Whether you are a certified PADI Diver or certified by another organization, you can take advantage of the National Geographic Portal. The PADI National Geographic Portal consists of a knowledge review based on information from the PADI National Geographic Diver Almanac and DVD. In addition, you'll fine-tune your buoyancy, navigation, exploration, and observation skills while on an open water dive. At Scuba Cat Diving, Phuket, Thailand all our scuba diving certification courses include manuals and free scuba diving equipment rental For the PADI National Geographic Diver program you'll receive the PADI National Geographic Diver Almanac and PADI National Geographic Diver DVD. In addition, we teach all of our diver level courses in small groups to ensure that you receive the attention that you deserve. All our courses are taught to PADI Standards. PADI National Geographic Diver Portal Course - 8,500 Baht (For certified divers 1 day/2 dives). Including the National Geographic Diver Almanac and DVD, scuba diving equipment rental, two boat dives, certification and instructor fees. After completing the PADI National Geographic Diver Specialty program, you'll want to continue your dive education. Or why not join us for some day trip diving or even a liveaboard trip? Interested in a career in Scuba Diving? Our Career Packages will open the door to a new life.